Souz Dal | Mmm, Tasty! Souz Dal is a recent discovery of ours. See, we’d wandered the College strip many times, window shopping and people watching, and wondered if any of the bars and clubs were anything more than just – dare I say it – meat markets. So many places were clearly see-and-be-seen, and since that isn’t our kind of fun, we’d been skipping College as a hang-out place for the most part. But back in November we decided to give Souz Dal a shot, based on some reviews we’d read, and the fact that the interior looked cozy and fun, not glitzy and overdone. It might be a recent discovery for us, but it certainly isn’t new – Souz Dal has been a fixture on College for more than fifteen years. The rusty globe sign and the domed ceiling are the first two things we noticed about the place upon entering for the first time. Then, scanning the room, we noticed the funky decor in warm colors, the candles on the tables, and the window seats with cushions. We also noted the middle table seemed to be taken up by a party, where everyone was dressed fairly casually and had a martini or cocktail in front of them. Generally, the vibe was relaxed and fun, so we decided to take the table next to the heater and stay a while. 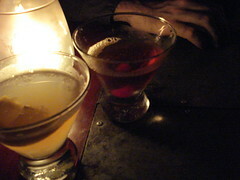 Wine, cocktails and martinis are the focus here – this is not the place for anyone looking for interesting beer. They do offer a single beer on tap (Amsterdam Blond) and a dozen or so beers in bottles, but nothing remarkable. We usually begin our night with a half litre of wine, then move to a cocktail or two. I’ve become fond of the good old Side Car, although I must note that they make a tasty Mint Julep here. Staff here are friendly and efficient, and seem to be used to doing crowd control; often larger groups will come in hoping for a table, and sometimes will even stick around, hovering over the bar for a while until a table does open up. They’ve even got a heated back patio that is open year round. We haven’t tried sitting there yet, since it seems far too cold this time of year, but we might on a more mild day in the spring or fall. 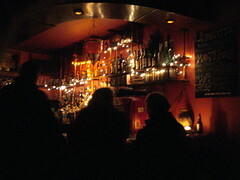 Just one warning – it’s hard to have just one drink here, so a typical visit is going to set you back a bit. This isn’t a cheap drinks student bar. It is, however, delicious! Souz Dal – 636 College Street (College at Grace). 416-537-1883. Vegan Cupcakes Take Over Freshbooks!